You eat periodically throughout the day; however, your organs, especially the brain, need a continuous supply of glucose. How does the body meet this constant demand for energy? Your body processes the food you eat both to use immediately and, importantly, to store as energy for later demands. If there were no method in place to store excess energy, you would need to eat constantly in order to meet energy demands. Distinct mechanisms are in place to facilitate energy storage, and to make stored energy available during times of fasting and starvation. The absorptive state, or the fed state, occurs after a meal when your body is digesting the food and absorbing the nutrients (anabolism exceeds catabolism). Digestion begins the moment you put food into your mouth, as the food is broken down into its constituent parts to be absorbed through the intestine. The digestion of carbohydrates begins in the mouth, whereas the digestion of proteins and fats begins in the stomach and small intestine. The constituent parts of these carbohydrates, fats, and proteins are transported across the intestinal wall and enter the bloodstream (sugars and amino acids) or the lymphatic system (fats). From the intestines, these systems transport them to the liver, adipose tissue, or muscle cells that will process and use, or store, the energy. Depending on the amounts and types of nutrients ingested, the absorptive state can linger for up to 4 hours. The ingestion of food and the rise of glucose concentrations in the bloodstream stimulate pancreatic beta cells to release insulin into the bloodstream, where it initiates the absorption of blood glucose by liver hepatocytes, and by adipose and muscle cells. Once inside these cells, glucose is immediately converted into glucose-6-phosphate. By doing this, a concentration gradient is established where glucose levels are higher in the blood than in the cells. This allows for glucose to continue moving from the blood to the cells where it is needed. Insulin also stimulates the storage of glucose as glycogen in the liver and muscle cells where it can be used for later energy needs of the body. Insulin also promotes the synthesis of protein in muscle. As you will see, muscle protein can be catabolized and used as fuel in times of starvation. If energy is exerted shortly after eating, the dietary fats and sugars that were just ingested will be processed and used immediately for energy. If not, the excess glucose is stored as glycogen in the liver and muscle cells, or as fat in adipose tissue; excess dietary fat is also stored as triglycerides in adipose tissues. [link] summarizes the metabolic processes occurring in the body during the absorptive state. The postabsorptive state, or the fasting state, occurs when the food has been digested, absorbed, and stored. You commonly fast overnight, but skipping meals during the day puts your body in the postabsorptive state as well. During this state, the body must rely initially on stored glycogen. Glucose levels in the blood begin to drop as it is absorbed and used by the cells. In response to the decrease in glucose, insulin levels also drop. Glycogen and triglyceride storage slows. However, due to the demands of the tissues and organs, blood glucose levels must be maintained in the normal range of 80–120 mg/dL. In response to a drop in blood glucose concentration, the hormone glucagon is released from the alpha cells of the pancreas. 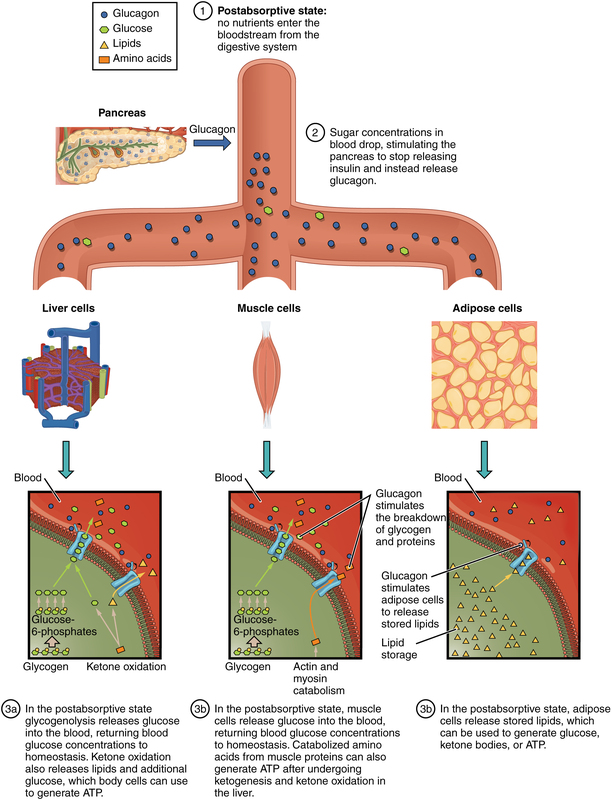 Glucagon acts upon the liver cells, where it inhibits the synthesis of glycogen and stimulates the breakdown of stored glycogen back into glucose. This glucose is released from the liver to be used by the peripheral tissues and the brain. As a result, blood glucose levels begin to rise. Gluconeogenesis will also begin in the liver to replace the glucose that has been used by the peripheral tissues. After ingestion of food, fats and proteins are processed as described previously; however, the glucose processing changes a bit. The peripheral tissues preferentially absorb glucose. The liver, which normally absorbs and processes glucose, will not do so after a prolonged fast. The gluconeogenesis that has been ongoing in the liver will continue after fasting to replace the glycogen stores that were depleted in the liver. After these stores have been replenished, excess glucose that is absorbed by the liver will be converted into triglycerides and fatty acids for long-term storage. [link] summarizes the metabolic processes occurring in the body during the postabsorptive state. When the body is deprived of nourishment for an extended period of time, it goes into “survival mode.” The first priority for survival is to provide enough glucose or fuel for the brain. The second priority is the conservation of amino acids for proteins. Therefore, the body uses ketones to satisfy the energy needs of the brain and other glucose-dependent organs, and to maintain proteins in the cells (see [link]). Because glucose levels are very low during starvation, glycolysis will shut off in cells that can use alternative fuels. For example, muscles will switch from using glucose to fatty acids as fuel. As previously explained, fatty acids can be converted into acetyl CoA and processed through the Krebs cycle to make ATP. Pyruvate, lactate, and alanine from muscle cells are not converted into acetyl CoA and used in the Krebs cycle, but are exported to the liver to be used in the synthesis of glucose. As starvation continues, and more glucose is needed, glycerol from fatty acids can be liberated and used as a source for gluconeogenesis. After several days of starvation, ketone bodies become the major source of fuel for the heart and other organs. As starvation continues, fatty acids and triglyceride stores are used to create ketones for the body. This prevents the continued breakdown of proteins that serve as carbon sources for gluconeogenesis. Once these stores are fully depleted, proteins from muscles are released and broken down for glucose synthesis. Overall survival is dependent on the amount of fat and protein stored in the body. There are three main metabolic states of the body: absorptive (fed), postabsorptive (fasting), and starvation. During any given day, your metabolism switches between absorptive and postabsorptive states. Starvation states happen very rarely in generally well-nourished individuals. When the body is fed, glucose, fats, and proteins are absorbed across the intestinal membrane and enter the bloodstream and lymphatic system to be used immediately for fuel. Any excess is stored for later fasting stages. 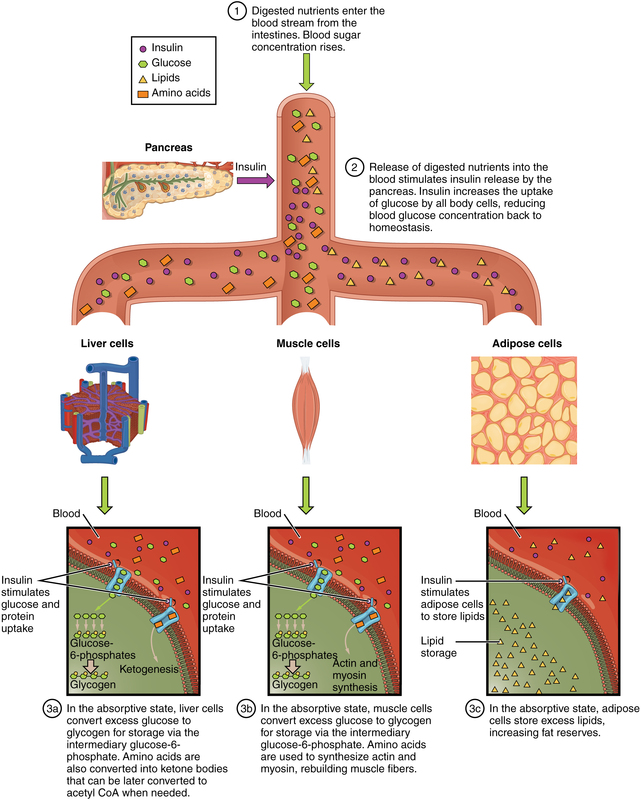 As blood glucose levels rise, the pancreas releases insulin to stimulate the uptake of glucose by hepatocytes in the liver, muscle cells/fibers, and adipocytes (fat cells), and to promote its conversion to glycogen. As the postabsorptive state begins, glucose levels drop, and there is a corresponding drop in insulin levels. Falling glucose levels trigger the pancreas to release glucagon to turn off glycogen synthesis in the liver and stimulate its breakdown into glucose. The glucose is released into the bloodstream to serve as a fuel source for cells throughout the body. If glycogen stores are depleted during fasting, alternative sources, including fatty acids and proteins, can be metabolized and used as fuel. When the body once again enters the absorptive state after fasting, fats and proteins are digested and used to replenish fat and protein stores, whereas glucose is processed and used first to replenish the glycogen stores in the peripheral tissues, then in the liver. If the fast is not broken and starvation begins to set in, during the initial days, glucose produced from gluconeogenesis is still used by the brain and organs. After a few days, however, ketone bodies are created from fats and serve as the preferential fuel source for the heart and other organs, so that the brain can still use glucose. Once these stores are depleted, proteins will be catabolized first from the organs with fast turnover, such as the intestinal lining. Muscle will be spared to prevent the wasting of muscle tissue; however, these proteins will be used if alternative stores are not available. During the absorptive state, glucose levels are ________, insulin levels are ________, and glucagon levels ________. Starvation sets in after 3 to 4 days without food. Which hormones change in response to low glucose levels? The postabsorptive state relies on stores of ________ in the ________. In type II diabetes, insulin is produced but is nonfunctional. These patients are described as “starving in a sea of plenty,” because their blood glucose levels are high, but none of the glucose is transported into the cells. Describe how this leads to malnutrition. Insulin stimulates the uptake of glucose into the cells. In diabetes, the insulin does not function properly; therefore, the blood glucose is unable to be transported across the cell membrane for processing. These patients are unable to process the glucose in their blood and therefore must rely on other sources of fuel. If the disease is not controlled properly, this inability to process the glucose can lead to starvation states even though the patient is eating. Ketone bodies are used as an alternative source of fuel during starvation. Describe how ketones are synthesized. When triglycerides and fatty acids are broken down, acetyl CoA is created. If excess acetyl CoA is generated in this process, the excess is used in ketogenesis or the creation of ketones. This creation results from the conversion of acetyl CoA by thiolase into acetoacetyl CoA. This acetoacetyl CoA is subsequently converted into β-hydroxybutyrate, the most common ketone in the body. For questions regarding this license, please contact partners@openstaxcollege.org. If you use this textbook as a bibliographic reference, then you should cite it as follows: OpenStax College, Anatomy and Physiology. OpenStax CNX. http://cnx.org/contents/14fb4ad7-39a1-4eee-ab6e-3ef2482e3e22@11.1. If you redistribute this textbook in a print format, then you must include on every physical page the following attribution: "Download for free at http://cnx.org/contents/14fb4ad7-39a1-4eee-ab6e-3ef2482e3e22@11.1." If you redistribute part of this textbook, then you must retain in every digital format page view (including but not limited to EPUB, PDF, and HTML) and on every physical printed page the following attribution: "Download for free at http://cnx.org/contents/14fb4ad7-39a1-4eee-ab6e-3ef2482e3e22@11.1."